How to install Sql Server Management Studio?? ?Why I can’t install Sql Server Management Studio??? Unable to install Sql Server Management Studio??? SQL Server Management Studio is a tool included with Microsoft SQL Server 2005 and later versions for configuring, managing, and administering all components within Microsoft SQL Server. The tool includes both script editors and graphical tools which work with objects and features of the server. Some time it becomes a mystery to install Sql Server Management Studio. 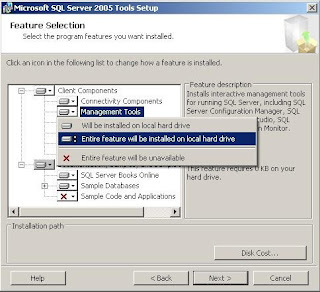 Normally you click setup file to install Sql Server 2005 and its components, though you have selected Client Components (Which includes Sql Server Management Studio) to install with other components, but after installation is complete, you can’t find Sql Server Management Studio in installed programs list. No need to uninstall and re-install your whole Sql Server 2005. 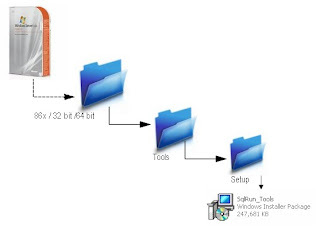 Leave the installed components as is and find out SqlRun_Tools setup file to execute, from following path. Click on CLIENT COMPONENTS, install it completly or you can just select Management Tools. What ever you select DON'T forget to select "Entire feature will be installed on local hard drive"
Click Next button and let it install and here is Sql Server Management Studio……. Thanks buddy.You saved my time. Thanks, I needed this long time ago. you don't know how do great help to me! If only I could find you somewhere to buy you couple of beers! Thank YOU! You are a great person. I get the same messages when I reinstalling whole MSSQL SERVER 2005. It says that "A component that you have specified in the ADD_LOCAL property is already installed..."
How do you do it for SQL 2008? Once again Microsoft have ****ed this up. I have struggled for hours trying to find it. Thanks, you saved a lot of time. Thanks! Been using SQL for awhile but never installed it myself..
Life saver... I was so confused that SQL Server Management Studio wasn't installed! The only thing I really NEEDED was SSMS, but after the install I couldn't find it anywhere. thanx a million times.ur advice had been a great help.i have been trying to install sql server 2005 for 2 weeks but failed.i followed ur instructions & it worked.thanks once again. This is great thenks, could I please just confirm if there is any risk of losing existing DB's when changing the installed feature? NO, not at all. But you must take regular backups of your production databases before any major change. But, for installing Client Components (SSMS etc.) will never effect your databases. nice, you really saved my time with this post. THANKS A LOT !!!! You really are a life saver !